Q: I will be building a new home in the spring and was wondering about the pros and cons of recycled-glass countertops in the kitchen and bath. Any advice would be appreciated. A: Recycled-glass countertops are very appealing. Just the thought of all those millions of bottles and glasses being recycled and repurposed fits nicely into our ecological thinking. This product has become very trendy; it's durable and comes in a variety of color mixes that suit any style. The glass particles add a lovely color and subtle glitter to the surface. However, it is expensive and not as easy to source as stone and solid-surface countertops. The recycled glass is combined with cement and is porous, so it requires sealing after installation, best done by your installer, and resealing every year or so. IceStone suggests a layer of wax applied after sealing to prevent any acidic liquids from staining it. You will find detailed information through companies such as www.icestone.biz. The bathroom counter shown here is IceStone's White Pearl. 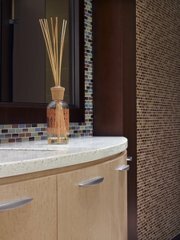 The backsplash of colored glass tiles makes a stunning contrast and shows the design versatility of both products for bathrooms and kitchens. Q: My husband and I are building our retirement home and are taking our cue for the kitchen from the 1950s Gaffers and Sattler range we inherited. The range is chrome and white, and we've chosen other chrome pieces (bar stools, lighting fixtures, vintage small appliances). The large kitchen has a 4-foot-by-6-foot island. We have found a pot rack that has two lights built into it and love it, but wonder if it would look out of place. Is it too modern? A: This is really a personal choice. Some cooks love to have their pots and pans on display, and the look works with any kind of design, from vintage to chic modern. Pot racks do take up visual space, especially if they are hung in the middle of the room. Think about all the chrome and accessories you plan to have on view and take care not to get too cluttered. Otherwise, your choice sounds great, and a clever design with the lights hidden within the rack. Q: We are fixing up our home to sell. The kitchen appliances are still in good working order, but are white. We'd like to make the room look more modern but can't afford to replace with stainless steel. What tips do you have to update the decor? The bathroom also could use help. Thank you. A: Today's kitchen accessories are so gorgeous they could sit on your coffee table! Dress up a plain white kitchen with these stylish accents. Invest in a stack of new mixing bowls that sit on the counter, a bright container filled with colorful kitchen utensils and a modern toaster in a bright color rather than the usual chrome. Choose a fresh stack of kitchen towels, and use some for show. You can prop your kitchen with these and take them with you when you move. Same approach for the bathroom. Spruce up with textured towels, cream dispensers and lovely big bars of soap.